King Jack Casino is an online gaming site where players can play and win real money. There is a large assortment of live casino games and exciting online slots to choose from. Expect the full royal treatment when you play at King Jack Casino. From the moment you register, you will receive bonuses. Get a welcome bonus with the first deposit and other amazing promotional offers like discounted deposit rates and free spins. 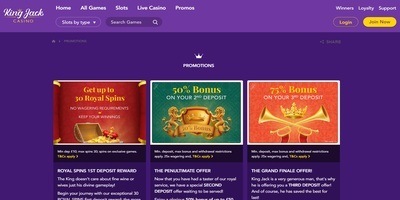 King Jack Casino offers loyalty points for their VIP customers. These loyalty points can be redeemed for bonuses and offline prizes. The company also offers players the chance to win featured monthly drawings. King Jack Casino has an easy play interface. It is not necessary to download any software to play. Play directly on their site from the platform of your choice at any time. Whether you play on your tablet, PC, or phone, the slots and other casino games they offer will keep you busy for hours. The company offers 24/7 customer assistance. They are quick to respond to email queries. Try your luck in one of their live casino games like roulette or blackjack. Play with other players and have the ability to chat with them to foster friendships. Set in a classy, sleek gaming interface, the online game atmosphere is authentic and stimulating. It’s like stepping into a real-life casino and playing with others at a table. If you are a fan of slots, you can pick from many different types to play. There are progressive slots, free spin slots, bonus round slots, tumbling reels, and many more. Check out popular slots like the progressive slot Pyramids Of Cash. Or try out the visually appealing bonus round slot, Amazon’s Diamonds. If you are a fan of tumbling reels, play the exciting slot, Invaders from Planet Moolah. King Jack offers slots with anything from 1 pay line to 100+ pay lines. If you are a fan of 3 reel slots with limited pay lines, consider playing the Fire Joker Slot for some ultimate fun. If you prefer multi-win pay lines, check out the well-loved 88 Fortunes Slot, which has over 243 ways to win. There are also a plethora of different themed slots to play. These slots include animals and nature; movies and adventures; food and fruits; pirates and treatures; Egyptian and ancient history. King Jack offers exclusive slots created by DaGaCube Games. This gambling game software provider creates incredibly attractive and fun games for players. The graphics and sound effects are top of the line and out of this world. These exclusive slots also offer generous payouts and extra bonus spins. Be sure to check out the new featured slot that the website introduces each week. King Jack works with many different reputable gaming software companies like MicroGaming Systems and Scientific Games. These gaming companies are constantly finding new and innovative ways to enhance play quality. They provide unique features like an extra set of reels, multiple grids, and stacked wilds. Collaborating with all these different gaming companies ensures that the player gets the best slots to choose from and also so many more ways to win. All games on the King Jack gambling site has been approved by the UK Gambling Commission. The company is also regulated by Alderney Gambling Control Commission.